Explore below key excerpts of revealing news articles on the Pentagon's development of scary genetically modified insects that can be used for nefarious purposes, a major study showing reduced cancer risk in those who eat organic food, the dramatic rise in autism incidence since 1970 and a split in the medical community regarding its cause, and more. Read also wonderfully inspiring articles on following your passions to reduce stress and increase happiness, the good news that too often goes unreported, the major food company Danone's move towards providing healthier food products, and more. You can also skip to this section now. Special note (sources may be less reliable): Listen to an inspiring four-minute audio by courageous economics expert Catherine Austin Fitts on how facing the AI (Artificial Intelligence) invasion is best managed with faith, hope, and love. Read this educational article to understand the risks and dangers associated with the flu vaccine. Explore the testimonies of two highly capable individuals who claim to have proof that they are being targeted using nanotechnology and more, a Catholic nun turned whistleblower, and a high-level Silicon Valley engineer. Exciting news for WTK subscribers! 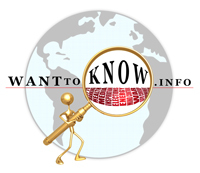 We have recently been developing a great way for WantToKnow.info subscribers to connect with and learn about each other. We're almost ready to roll out a community section on WTK for this purpose. For those who want to take part in beta testing, you can sign up now at www.WantToKnow.info/community. This new section of our website is for subscribers to our email list only. You'll be hearing more about this soon! Note: A gag order was placed on Mark Steele, yet he won in court after members of the city council could not even describe what their secret 5G rollout was about. For more along these lines, see concise summaries of deeply revealing wireless technology dangers news articles from reliable major media sources. In a combative exchange at a hearing Friday in Washington, D.C., a federal judge unabashedly accused career State Department officials of lying and signing "clearly false" affidavits to derail a series of lawsuits seeking information about former Secretary of State Hillary Clinton's private email server and her handling of the 2012 terrorist attack on the U.S. Consulate in Benghazi, Libya. U.S. District Court Judge Royce Lamberth also said he was "shocked" and "dumbfounded" when he learned that FBI had granted immunity to former Clinton chief of staff Cheryl Mills during its investigation into the use of Clinton's server, according to a court transcript. The Department of Justice's Inspector General (IG), Michael Horowitz, noted ... in June that it was "inconsistent with typical investigative strategy" for the FBI to allow Mills to sit in during the agency's interview of Clinton during the email probe, given that classified information traveled through Mills' personal email account. "[T]here are serious potential ramifications when one witness attends another witness' interview," the IG wrote. The transparency group Judicial Watch initially sued the State Department in 2014, seeking information about the response to the Benghazi attack after the government didn't respond to a Freedom of Information Act (FOIA) request. Parallel lawsuits ... are probing issues like Clinton's server, whose existence was revealed during the course of the litigation. Researchers across Canada are racing to shed light on a bleak part of the country’s history: How many indigenous children died at residential schools, and where are their unmarked graves? From 1883 to 1998, nearly 150,000 indigenous children were forcibly separated from their families and sent to the government-funded, church-run boarding schools in an attempt to assimilate them. Once there, they were frequently neglected and abused. What happened at the schools was akin to “cultural genocide,” concluded a 2015 report from Canada’s Truth and Reconciliation Commission. It also found that at least 3,200 students died at residential schools ... though the commission contended that the number was probably much higher and merited further investigation. In 2015, Prime Minister Justin Trudeau promised to implement the Truth and Reconciliation Commission’s calls to action, [which include] creating a register of the missing children and mapping their graves. But nearly three years later, some say that a lack of resources and missing documents is inhibiting progress, increasing the likelihood that the relatives of missing residential-school children will die without knowing the fate of their loved ones, and that unmarked graves could be destroyed. School records were often destroyed or inconsistently kept. Officials also frequently failed to record the name and gender of students who died or the cause of death. Authorities even neglected to report the deaths to the parents. Note: Read more about the role of these schools in Canada's "cultural genocide" of First Nation peoples. For more along these lines, see concise summaries of deeply revealing civil liberties news articles from reliable major media sources. Australian Prime Minister Scott Morrison has given a national apology to victims of child sexual abuse. It follows a five-year inquiry which found tens of thousands of children had suffered abuse in the nation's institutions over decades. "Today, we finally acknowledge and confront the lost screams of our children," he said. The inquiry, which concluded last December, heard more than 8,000 testimonies from victims about abuse in organisations such as churches, schools and sports clubs. Many survivors have criticised the government's response to the inquiry - especially its terms for a national compensation scheme. Victims are eligible for payments of up to A$150,000 (£80,000; $106,000) each. Some say the compensation is not enough, and onerous to obtain. Mr Morrison said the government had accepted most recommendations from the inquiry, but it was still considering the remaining proposals. Those not yet adopted include recommendations where federal and state responsibilities overlap. The most contentious is a proposal to make reporting abuse mandatory. In August, the Catholic Church formally rejected that call - meaning it will not force priests to break confession rules. In their final report, the commissioners said: "It is not a case of a few 'rotten apples'. Society's major institutions have seriously failed." They said over 15,000 people had contacted the inquiry, raising allegations against more than 4,000 institutions.